Erika Denise Edwards, "A Tale of Two Cities: Buenos Aires, C�rdoba and the Disappearance of the Black Population in Argentina," The Metropole: The Official Blog of the Urban History Association, May 31, 2018. https://themetropole.blog/2018/05/31/a-tale-of-two-cities-buenos-aires-cordoba-and-the-disappearance-of-the-black-population-in-argentina/. Twelve years after introducing himself to the American public as the son of an immigrant, the president recast himself as a bearer of Scotch-Irish values. Twelve years ago, Barack Obama introduced himself to America as just a skinny kid with a funny name. He made his story into the American story—a tale of immigrant hopes, of opportunities, of success that could only come true in the United States. That speech launched him to the presidency. Scotch-Irish mostly, farmers, teachers, ranch hands, pharmacists, oil-rig workers. Hardy, small-town folk. Some were Democrats, but a lot of them, maybe even most of them, were Republicans—Party of Lincoln. My grandparents explained that the folks in these parts, they didn’t like show-offs. They didn’t admire braggarts or bullies. They didn’t respect mean-spiritedness, or folks who were always looking for shortcuts in life. Instead, what they valued were traits like honesty and hard work. Kindness; courtesy; humility; responsibility; helping each other out. That’s what they believed in. True things. Things that last. The things we try to teach our kids. My heart raced and emotions surged before I consciously grasped the meaning of what I was reading in that footnote. Reading all the footnotes had become routine for me, because ages ago I learned that important information about my people and my interests would more often than not be buried there, if mentioned at all. But, here was something really startling to me—mention of Humboldt, Kansas. That tiny southeast Kansas town had been the lifelong hometown of my grandmother, Gertrude Stovall (who was 101 years old when she died in 1990), and it is where I plan to be buried, amidst five previous generations of my mother’s family. Here it was being specifically proposed as the place for an event that, had it occurred, might very significantly have impacted if not altered American history during the Civil War. The footnote quoted a letter to President Lincoln from emissaries of Opothleyahola, a legendary leader of the traditionalist faction of the Muskogee Indians (whom the whites called “Creeks”). I had come to focus on this leader in my quest to understand the famous “Trails of Tears” over which almost all of the Indians of the southeastern states had trekked when they were forced out of their traditional homeland to “Indian Territory” (now Oklahoma). In the letter, the Native American leader was proposing to convene all the mid-western Indian tribes in a gigantic General Council meeting, to demonstrate their continued loyalty to the Union and to secure enforcement of the treaties that his people had signed with the United States government decades before. Now they needed to meet to make good on those pledges. Of all places, Opothleyahola proposed to hold that meeting in Humboldt! …In pursuit of information about my own ancestors I was struck by several features of the 1860 federal census rolls for Arkansas, which includes the schedules for Indian Territory. Most notably, nearly all the Creek Indians were listed as “Black.” Would that designation have today’s significance? I had read about extensive African and Creek mixing. After all, it was probably to the Creeks that blacks had escaped as early as 1526 from L. Vasquez deAyllon’s shipwrecked settlement on the Carolina coast. I had read about the ancient Creek migrations from the Southwest, where the indigenous populations were considerably darker than the Cherokee and other Iroquoian speaking peoples of the East, and may have mixed with Africans during early Spanish exploration and colonial times, as seems evident among Mexican populations, and some say even well before that! But could such mixing have been so extensive as to affect the majority of the Creeks? I began to suspect these particular white census enumerators impulsively listed persons of dark complexion simply as “black.” This would not necessarily reflect the standard “one-drop” American practice and imply “African.” Moreover, many of the dark Creek Indians have very straight hair, so I became skeptical. Another interesting feature of the census for Indian Territory was the special note by the enumerator that the Seminoles refused ever to allow a listing of “slaves”; it seemed to be a reaffirmation of the earlier removal-treaty negotiation experience. However, the Seminoles, whose Nation arose out of a significant social, political, and genetic integration of persons of Native American and African American background, were not all listed as “black.” Perhaps the color designations for the Creeks were valid clues to their identity after all. 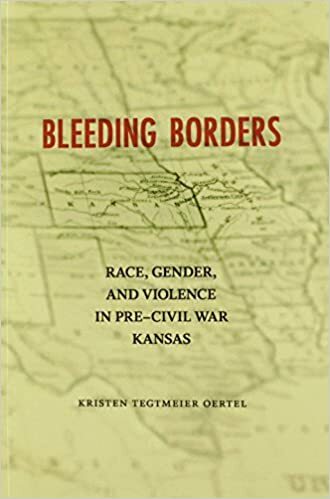 In Bleeding Borders, Kristen Tegtmeier Oertel offers a fresh, multifaceted interpretation of the quintessential sectional conflict in pre-Civil War Kansas. Instead of focusing on the white, male politicians and settlers who vied for control of the Kansas territorial legislature, Oertel explores the crucial roles Native Americans, African Americans, and white women played in the literal and rhetorical battle between proslavery and antislavery settlers in the region. She brings attention to the local debates and the diverse peoples who participated in them during that contentious period. Oertel begins by detailing the settlement of eastern Kansas by emigrant Indian tribes and explores their interaction with the growing number of white settlers in the region. She analyzes the attempts by southerners to plant slavery in Kansas and the ultimately successful resistance of slaves and abolitionists. Oertel then considers how crude frontier living conditions, Indian conflict, political upheaval, and sectional violence reshaped traditional Victorian gender roles in Kansas and explores women’s participation in the political and physical conflicts between proslavery and antislavery settlers. Oertel goes on to examine northern and southern definitions of “true manhood” and how competing ideas of masculinity infused political and sectional tensions. She concludes with an analysis of miscegenation–not only how racial mixing between Indians, slaves, and whites influenced events in territorial Kansas, but more importantly, how the fear of miscegenation fueled both proslavery and antislavery arguments about the need for civil war. As Oertel demonstrates, the players in Bleeding Kansas used weapons other than their Sharpes rifles and Bowie knives to wage war over the extension of slavery: they attacked each other’s cultural values and struggled to assert their political wills. They jealously guarded ideals of manhood, womanhood, and whiteness even as the presence of Indians and blacks and the debate over slavery raised serious questions about the efficacy of these principles. Oertel argues that ultimately, many Native Americans, blacks, and women shaped the political and cultural terrain in ways that ensured the destruction of slavery, but they, along with their white male counterparts, failed to defeat the resilient power of white supremacy. Moving beyond a conventional political history of Kansas, Bleeding Borders breaks new ground by revealing how the struggles of this highly-diverse region contributed to the national move toward disunion and how the ideologies that governed race and gender relations were challenged as North, South, and West converged on the border between slavery and freedom.